Can You Drive Under A Moose? Today we saw Toyota joking that its GT86 doesn't care about dodging moose. What if you didn't want to dodge a moose but drive completely under one? Our readers think it might be possible. StoneCold calculated that (under ideal conditions) a Scion FR-S would in fact be able to drive under a moose, so long as that moose was really freakin' huge. The FR-S is ~1.29m high. Give it a healthy inch and a half drop to 1.24m. It is also ~1.78m wide. The tallest Alaskan moose ever found was about 2.4m at the shoulder. From naturalist sketches and photography, it appears a little over half the height of bull moose is composed of leg height. This leaves us with just enough room. The problem arises with the space between the legs. 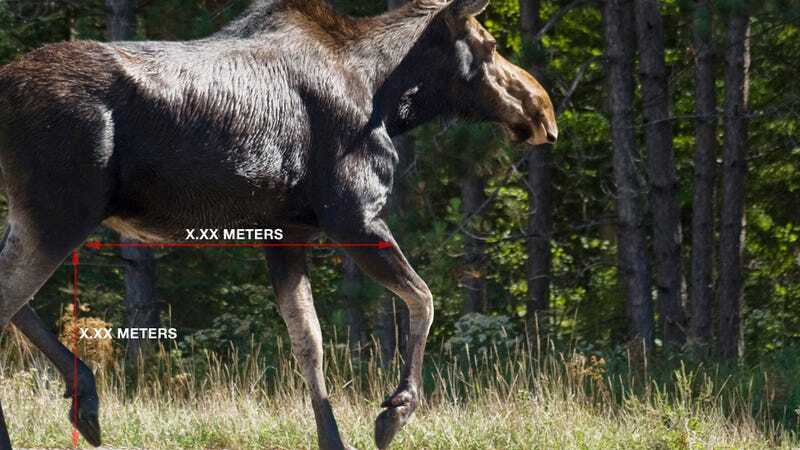 Again from sketches and photography, it seems that haunch to forward shoulder is ROUGHLY (emphasizing the approximation) half of a moose's length. The largest of moose get to be 3.5m. But the moose would have to be standing stock-still, otherwise the stride considerably shrinks the available space. Hypothesis: If given the largest moose in the entire world in real world conditions, then a Scion FR-S will not be able to drive under it. Drifting is out of the question. Still, I am piecing a letter to Mythbusters together. I would love this hypothesis to be proven wrong. Justinw8383 pointed out that Mythbusters busted the myth that you can drive under a moose, however RamblinRover noted that the Mythbusters only tested average sized vehicles and average sized moose. Moreover, their question was strickly based on minimizing impact damage through speed. There was still room, so to speak, for success. StoneCold reiterated, "They're gonna need a bigger moose." RamblinRover posited that perhaps the correct direction for the test is not with a bigger moose, but with a smaller car. None are smaller than the Peel Trident, cousin to the car Jeremy Clarkson drove through the BBC. Perhaps we do not need funding, but just a suitably patron, StoneCold returned. If a certain Morgan owner would possibly lend us his (as it seems he likes to do with Jalopnik related activities), the Morgan is 1.48m and would be an ideal candidate. Now this has me wondering about other animals such as the Giraffa camelopardalis or the Loxodonta genus. Is the study of driving under animals a thing? If not, Dr. Rover, we are PIONEERS. RamblinRover continued to open up further non-moose-animal-related options. Giraffa camelopardalis has, in all likelihood, been attempted, but likely without rigor. In that specific case, width is the absolute constraint, as height is so much greater in proportion. In movement, with the long strides, it may prove that only something as narrow as a motorcycle will navigate with safety, but assuming an un-panicked animal, it may be possible to go beyond subcompact vehicles all the way to compacts! A SMART is likely to function in this test even without a maximally-sized animal. That, however, would mean someone would have to drive a SMART. Also, we shouldn't expand study to Rhinocerotidae. Their... appreciation for motor vehicles might be less than ideal. Another suggestion came from Marimvibe. Loxodonta Africana would also be an interesting test. Unlike the moose and giraffe, where the likely consequence of failure is knocking out the legs and having the animal fall onto the car, consequences in this case may be a much more abrupt stop. Well, now we just need a giraffe, an elephant, an unusually large moose, and a Morgan Three-Wheeler to make animal/automotive history!